Congress as policy always wanted week states. Not only this this villain laid down the policy to discriminate one state from the other. Tax devolution to states will rise a huge and unprecedented 10 percentage points to 42% of the divisible pool of the Centre’s tax revenue between FY16 and FY20, compared with the previous five-year period, as the Narendra Modi government, vouching for cooperative federalism, accepted the recommendations of the 14th Finance Commission (FC). Along with the commission-prescribed statutory grants, the total untied transfers to states in the next five years will be 47.7% of the pool, up from over 39% between FY11 and FY15, giving a tremendous boost to states’ fiscal space and spending flexibility. Despite the largesse, the Centre’s fiscal capacity won’t be constrained much either, as aggregate transfers to states from its gross revenue receipts will remain at 49.4% in the next five years, almost the same as now. It also has the option of slashing the discretionary (tied) outlays to the states while remaining committed to Union list items and expending judiciously on programmes that complement states’ spending on items in the concurrent list. The tied transfers to the states include those under centrally sponsored schemes (CSS), which were reduced to 66 including 17 flagship schemes in the FY15 Budget from 126 earlier, besides various additional central aids and special Plan assistance. Following the acceptance of the FC’s recommendations, the Centre, in an action-taken report on the same in Parliament on Tuesday, announced withdrawal of financial support to eight CSS and this process could gradually be accelerated. Prime Minister Narendra Modi on Tuesday wrote to the state chief ministers, urging to “tailor-make” CSS as per their needs. However, he iterated that the Centre will continue to support national priority projects like poverty elimination, MNREGA, education, health, rural development and agriculture, among others. Stating that the Centre is only happy to transfer more resources to states that are going to be strong partners in the development paradigm of the Modi government, finance minister Arun Jaitley said the Centre would expect the states to become financially self-sufficient gradually. With the higher devolution from the Centre, in the case of many states, these transfers will now become on a par with their own revenue resources. While states’ own revenue was estimated at R8.9 lakh crore in FY14, aggregate transfers to the states is seen to be R8.7 lakh crore in FY16 and over R10 lakh crore in the next year. As per the FC’s award, the tax devolution to states would rise from R3.82 lakh crore budgeted for FY15 to R5.79 lakh crore in FY16, and untied grants from R64,675 crore to R88,865 crore. A press statement issued by the government, however, put the tax devolution to states in FY16 to be R5.2 lakh crore, also revising the FY15 figure downwards to R3.48 lakh crore. Outlining the principles that govern the grant-in-aid to states’ revenues by the Centre, the commission, headed by former RBI governor YV Reddy, said the distinction between Plan and non-Plan could be done away with and proposed grants amounting to Rs 1.95 lakh crore over the next five years for 11 states that would continue to be revenue-deficit even after the generous devolution. During FY16, these states, which include post-division Andhra Pradesh, West Bengal, J&K, Kerala, Assam and most northeastern states, will get an extra Rs 48,906 crore. The FC recommended a total grant of Rs 2.87 lakh crore to local bodies (which is part of the untied transfers to states). It changed the criteria for determining the inter-se shares of states in tax distribution by assigning the highest weight of 50% to ‘income distance’, followed by population (17.5%), area (15%) and demographic change (10%). It introduced the new criterion of forest cover (7.5%) while dispensing with fiscal consolidation as a yardstick, in what showed the increase fiscal autonomy envisaged for states. Sticking to the fiscal consolidation path drawn by the 13th Finance Commission, Reddy’s panel said “the ceiling on the (Centre’s) fiscal deficit will be 3% of the GDP from the year 2016-17 onwards up to the end of the award period”. It said the gross tax revenue of the Centre as a share of GDP will rise only modestly from 10.6% (Budget estimate) in FY15 to 11.4% in the final year of its award period. NEW DELHI: The Narendra Modi government came good on its pledge to treat the states as partners in long-term development in a spirit of cooperative federalism by accepting a key recommendation of the 14th Finance Commission. The Centre will start transferring a much bigger share of central taxes to states — the 10 percentage point jump to 42% will translate into an additional, estimatedRs 1.78 lakh crore in the next fiscal year. "We are moving away from rigid centralised planning, forcing a 'one-sizefits-all' approach on states," Prime Minister Narendra Modi said in a letter to state chief ministers in which he communicated the government's acceptance of the commission's recommendations. "States have always been voicing their opposition to this philosophy for years," he said. The changes that have been set in motion should ensure that states will now have greater control over their economic futures besides being able to tailor social welfare programmes to their own particular needs, among other things. The government presented the commission's report in Parliament on Tuesday along with the action-taken report in the first of a series of big-picture financial announcements this week. The Economic Survey for FY15 will be presented on Thursday, the Railway Budget a day after that and the Budget on February 28. As per the recommendation of the commission headed by former Reserve Bank of India governor YV Reddy, the total devolution to the states in FY16 will be Rs 5.26 lakh crore against Rs 3.48 lakh crore in FY15. The recommendations of the finance commission will have a substantial impact on budget-making for the Centre with a number of departments witnessing big reductions in their allocations. The Centre has decided to discontinue support to eight centrally sponsored schemes, albeit fewer than the commission's recommendation of 30. "This is the largest ever change in percentage of devolution. 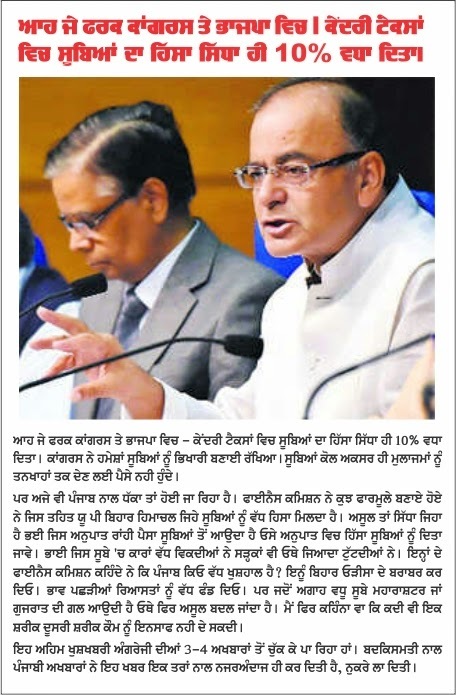 In the past, when finance commissions have recommended an increase, it has been in the range of 1-2%," Finance Minister Arun Jaitley said at a press conference. However, this is not likely to affect his budget as the total support to states was pegged at 63% of taxes, almost the same as earlier. "The finance commission has subsumed both plan and non-plan expenditure. Moreover, it has not given any sectoral grants, not even for environmental or healthcare. However, this implies that grants for centrally sponsored schemes will have to be curtailed. Else, they will have to raise revenue or cut expenditure," said M Govinda Rao, a member of the commission. The acceptance of the recommendations mark at least five major shifts from the past. First, the sizeable increase in tax devolution. Second, taking into account plan revenue expenditures while assessing revenue deficit grants. Third, discontinuing the distinction between special category and other states. Fourth, desisting from awarding sector/state specific grants or to subject grants to conditionality. And, fifth, to suggest institutional mechanisms for better monitoring of fiscal rules and to achieve 'cooperative federalism'. The core of this last lies in both increasing the proportion of (virtually much the same) aggregate transfers that will be available as non-debt transfers and to get rid of a swathe of central conditions and restrictions on how to utilise these funds. This will be a huge help to states in forging their own autonomously generated development scheme and keeping their fiscal deficit in check in the years to come. "In our assessment, the share of grants and tax devolution to states in the gross revenue receipts has been projected to increase from 47.5% in 2014-15 (base year, as per the previous finance commission formula) to 49.4% in 2019-20," the report said. "Thus, the equivalent share as a percentage of divisible pool is set to increase from 61.9% to 63.9%." It also made additional provision for revenue deficit states. To be sure, with these additional receipts in hand, states will see central support to state plans for the revenue part of the expenditure cease. State governments welcomed the higher devolution. "The decision to significantly increase the states' share will enable the states to utilise the enhanced resources according to the felt needs of the residents of the state," Haryana chief minister Manohar Lal Khattar said. Compared with the devolution in FY15, the total outgo to the states in FY16 will see an increase of more than 45%, Jaitley said. Abhijit Sen, one of the four members of the commission, submitted a dissent note suggesting that devolution to the states should be pegged at 38% in the first year and maintained at that level unless there was an agreement to deal with fiscal problems. The commission suggested a fiscal deficit target of 3.6% for FY16 and 3% in subsequent years during the award period that runs to FY20. By accepting the recommendations of the finance commission, the Centre also has implicitly endorsed the fiscal deficit target of 3.6% of GDP for FY16 and 3% thereafter. By parting with a larger share of tax revenue, the Centre has to meet a larger share of its own expenditure via non-tax receipts including borrowings. However, it can significantly reduce the borrowing it currently undertakes to lend to states. The commission has recommended creating a fund for compensating states for any loss arising from transition to the goods and services tax, suggesting that such compensation be made available for five years --100% of shortfall in the first three, 75% and 50% in the remaining two, respectively. GST is scheduled to be rolled out on April 1, 2016. The finance commission has made some grants to states to be passed on to panchayats and municipal bodies. It has made recommendations on how to collect funds for disaster management. The government has accepted the recommendation of the 14th Finance Commission for a record 10% increase in the share of states in Central taxes. Prime Minister Narendra Modi said it would strengthen states to design and implement schemes as per their needs. The major takeaway of the report of the 14th Finance Commission, headed by former RBI Governor YV Reddy for 2015-2020, is the increase from 32% to 42% in the devolution of the divisible pool of resources to states. The Finance Commission gives recommendations on specified aspects of Centre-State fiscal relations. As against a total devolution of Rs 3.48 lakh crore in 2014-15, the states will get Rs 5.26 lakh crore this fiscal. States had sought greater autonomy in implementing schemes as per their requirements as the centrally sponsored schemes did not meet the local needs. The commission has also recommended a grant of 1.94 lakh crore over five years to meet the revenue deficit of 11 states including Jammu & Kashmir, Himachal Pradesh, Kerala, West Bengal among others. 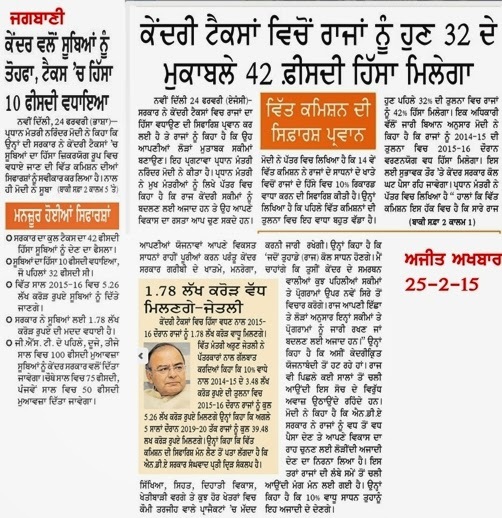 Finance Minister Arun Jaitley said that after the increased devolution of 42%, Punjab would not remain a revenue deficit state although its problem of old debt will remain. The commission has also recommended on the inter-se distribution of the states’ share amongst the states of the total pool based on criteria like population, changes in population, income distance, forest cover and area. 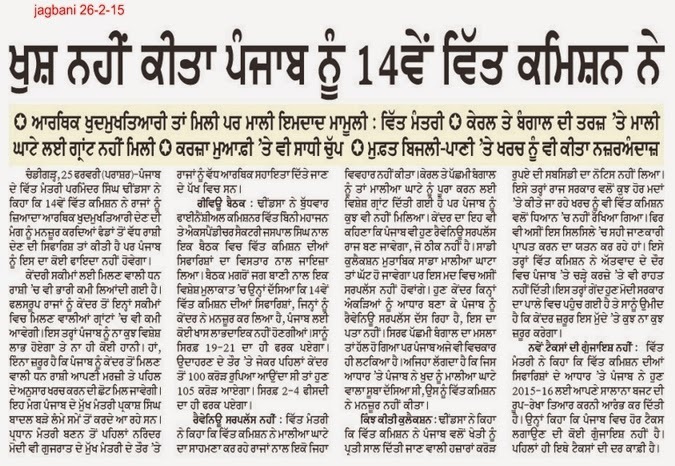 Based on this, Punjab has a share of 1.577%, Haryana 1.084%, Himachal 0.713%, Uttarakhand 1.052% and J-K 1.854%. The commission also provided for Rs 2.87 lakh crore for a five-year period for panchayats and municipalities. In a letter to all CMs, the PM said the government has decided to devolve maximum money to states and allow them the required freedom to plan the course of states’ development. The commission has also made a fundamental shift in the pattern of financing revenue expenditures.